Interesting look, I like #1and #2, especially #2 with white boots . I laugh to myself when you post things, and it’s as if you’re reading my mind! Yesterday’s shoe post caused me to have 3 items in my Zappos cart that I’m contemplating…because I’m trying to visualize outfits. You guessed it, they are all combat boots – two Frye and one Red Wing. Thanks for your fashion ESP, Angie! I like the practicality of these boots and particularly love the contrast they provide in the outfit with the pleated skirt. Being a lover of Dr Marten boots – I happily wear formulas 1, 2 & 3. I love the comfort and the hard edge that my boots can give to pretty outfits. Some more refined combat boots would be lovely, but I don’t think I could wear them to work (they are too casual for my workplace) so I don’t see me adding these to my wardrobe. Although I often say things like that and end up being a lemming! Wow! These are all great! Didn’t realise their were so many options for my combat boots! I love all of these!! The juxtaposition of a chunky, stompy boot with a pleated skirt or blazer?! SQUEE!! And the earthtones in 2 make me swoon! It’s minus 26F wind chill right now; I may have to play in my closet… thanks for the ideas!! DD(21) has a look similar to nr 3 and I can see you Angie in nr 2 (because of the white boots of course) but love all the others, too! I have the frye Julia shield and my beloved very refined and elegant allsaints lucie boot and paddock boots the ariat heritage lacer but similar feel and don’t forget black leather hiking boots will give a similar vibe – I always wear them with black leggings or tights for a long line but I love a tough edge with a super ladylike vibe. 1&3 without the flash of skin is closest to what I would wear. It’s also a comfort thing – secure, happy well supported feet and many come in waterproof styles. But reminder there are refined dressier styles with small heels like the allsaints lucie which is a real crossover style. I don’t own combat boots but DD(11) wears combat boots almost exclusively and has a few pairs in her collection. We have the same shoe size, so I am tempted to borrow from her just to play in my closet. Funny, I was just browsing Dr martens to be twinsies with Jane! Like these looks! I don’t have a pair of combat boots at the moment; they can be literally too heavy on my feet and are a bit off from my current style preferences. These looks pique my curiosity, especially since the right pair would be practical here. The uber-refined Givenchy boots in #4 are the most amazing version of a combat boot I’ve ever seen! 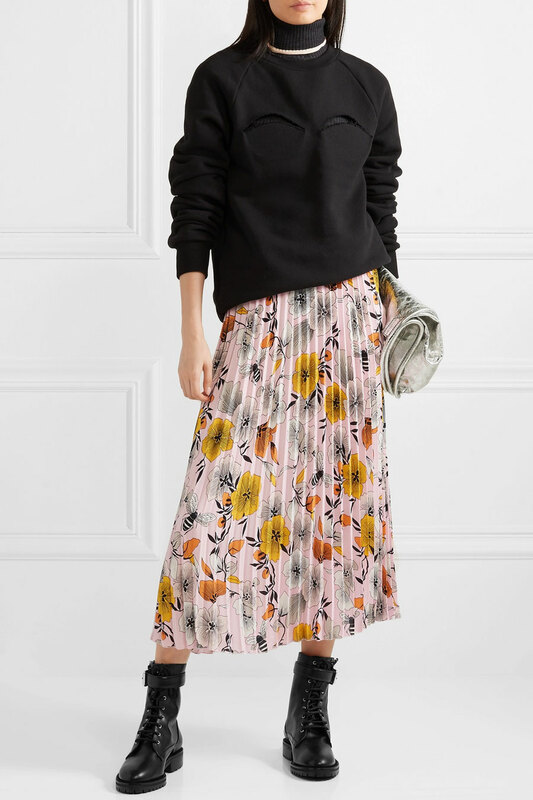 And, the floral skirt look of #3 is lovely. I hope people post their own versions of this formula! Love these looks! I have have worn variations of all but the soft and playfully patterned but plan on remedying that soon. I have a black pair of Miz Mooz lace ups past their prime and a pair of cadet blue Docs that I think will just get better with age. I’d love a refined pair at some point. I have a tulle skirt on the way and can’t wait to try it with my Docs! You’re right Angie, I love this post! For some reason I have never been drawn to combat boots. This surprises me because I love moto boots and they seem to have a similar vibe. I do like the looks of these outfits. Love #1! Your post is timely for me. I’ve been shopping around to add a waterproof boot to my collection and have been considering a combat boot style. I’ve never owned combat boots, so I thought it would be fun to play around with something outside my comfort zone and see how they feel. I’d happily wear all 4 looks, and am really enjoying a new pair of very refined and “bougie” (new favourite word – one which my daughter and I are having fun with ) combat boots I purchased a couple of weeks ago. A skirt I hope to wear them with is winging it’s way to me right now, in fact. I have never, ever been drawn to Doc Martens (the sole and yellow stitching throws me off) and they wouldn’t feel authentic for me anyways, so I love to wear other representations of this style. If I had the opportunity to wear them more often, I’d even consider a white pair! Now this is my kind of ensemble. If I had more options for casual winter skirts or dresses, #3 and 4 are how I would wear them. As it is, I am all about the type of outfit in #1 and 2! I have worn my old Ugg Finney moto boots so much they are starting to look shabby. Part of me wants a new version, but I think I will try doing a bit of DIY leather conditioning and cleaning for now. I have some other good stompy boot options now that take some of the heavy lifting off of those boots. Be still my combat-boot-loving heart! I posted recently asking for input on how to style my boots and this gives me a few more ideas. I like to soften the edginess of the boots with feminine tops which I always pair with jeans. I think I need to experiment more with skirts and dresses to push out a bit from my comfort zone. I ve be really drawn towards this style of boot this year looking to replace an old pair that I had.I ve got a dark red patent pair but ca n feel a black pair calling as well,just haven’t found the ones yet but when I do all these styling suggestions will come in handy. I don’t currently own combat boots, but love them with the skirt in pic 3. I wouldn’t be sad if combat boots somehow made it back into my wardrobe, though I’m not actively looking for them. I have two pairs – one flat, one with a short heel (funny story- I bought them at the same time and when I came home and showed DH, he said “Why did you buy two pairs of the same shoe?”. Me: “No, no they’re different, see – one has a heel”). I wear them frequently on the weekend but this post gives me inspiration to wear them with something besides jeans. I really love the juxtaposition of this look , and admire those that can pull it off with panache. I don’t own combat boots and likely never will because I like delicate footwear for myself . But I absolutely love this look! I would wear white combat boots……but it's not a priority. Laura, are you having a '90s flashback? WandaB, fun to have read your mind. deluked, combat boots will look fab with your fun assortment of frocks. Gryffin, how about with skirts and dresses? Bijou, kellygirl and Janet, you were the first people I thought of when putting together this post. You own it. Lisa P, your new bougie boots work well in this ensemble. Hope the skirt works out too. Taylor, high five. I bat for Team Dainty Footwear too. Joy, I can see you in #2. I love all of these (she says, surprising nobody). Am actually wearing my teal combat boots today, with a column of black (less structure than #1.). Love these! I’m wearing burgundy Timberlands as my chunky boots this winter and loving them – so study and solid. In my climate it’s skinnies rather than rolled up jeans, but that still showcases the boot. 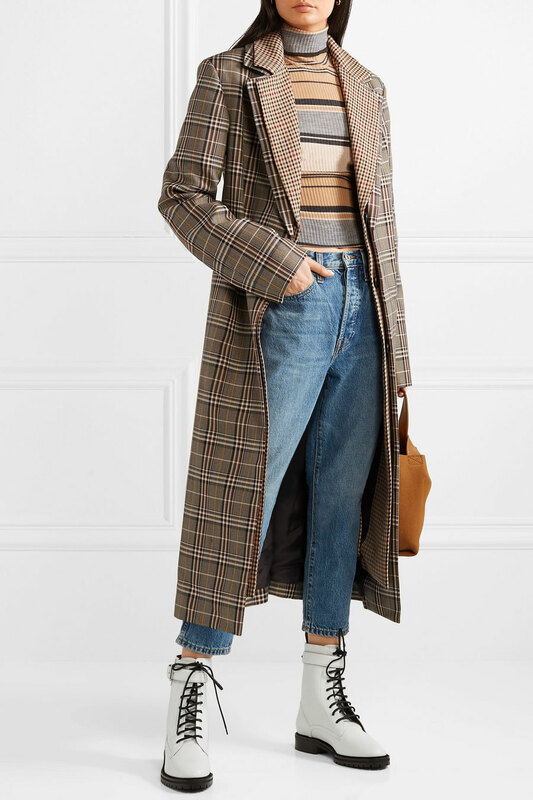 The second look with the menswear jacket is my fave and you’re also giving me ideas on how I *might* be able to do the striped/ribbed top this time around – in neutrals rather than crazy colour combos. Yes Angie – with tunics and dresses always but with leggings and tights under . I don’t do boots bare skin dress/tunic or pants. something black bridges the boots and the outfit. skirts I wear less – unless it’s skirted leggings which I wear with above. Love the white boot look & the two skirt looks. fantastic! i am actually wearing a variation on look number one today, totally by coincidence! dark red combat boots, turned up, cropped jeans, palest pink sweater, with a large gold beetle brooch. Angie, I’m trying to think through how combat boots might or might not work with dresses and skirts. For instance would they work with your new red Free People dress? I can’t tell whether the hem is even or perhaps too long…. I’m echoing WandaB as it seems like you’re reading my mind as well. I have a pair of dark red Doc Martens on order and I’m SO hoping they will fit and look good with my midi skirts. As for the 90s, they were all a blur, as that’s when I had my children and was a busy momma! I like these a lot — all of them. I don’t have actual combat boots but my Taos lace up boots give a very similar vibe. I would like to do a version of all of these — mine would be ink blue rather than black where black appears here. Coming back to note that the proportions may be key here and could be tricky to achieve straight out of one’s closet. It looks as if they only show a sliver of skin between boot and skirt or pant. That mitigates any shortening effects of the rest of the outfit I suspect and also draws attention to the boots as an intentional element. These are great inspiration for the white boots we bought together in Arnhem, Angie. Thank you! Adore these looks but I’m wondering if there are any combat boots soft enough for my unbelievably fussy feet? I thought I didn’t like combat boots for me until I saw the white ones. However, looking at my wardrobe, my size 11 feet, and the extent to which I scuff my shoes, I think I will pass. Although if I came across a pair while shopping I might try it on. Absolutely fabulous post! I have several pairs of boots that despite being a bit different than the classic combat boot still have the same vibe and during winter in the slush and snow they are one of my options to both stay dry and warm and still be stylish (in a edgy and rate way but at least I’m not in snow boots). With some tweaks and substitutions I could assemble all four ensembles. So I’m saving all of them in my inspiration folder and start creating outfits. Really happy for that since I don’t find often inspiration for cold weather outfits with boots other than heeled and refined ones. The architectural darkness is fabulous! Love the look. Diana, you own this look too. Gryffin, YES. With hose or leggings because you have to be warm. I get that by a billion trillion percent. I don’t do boots and bare skin either. Anna! You need a fun midi. Erinalter, your outfit sounds fab. Classically Casual, that would depend on the combat boot. But YES in theory. Combat boots work well with Prairie type midi dresses. Uneven or long hems should work just fine. Kim M, I want to see your new Docs. Suz, dark blue is your black. You could wear black hose or socks with all these outfits but #2. There I would add a light pair of socks or knee highs. In that way, I don’t think that proportions would be effected. Inge, YES. Your white lace up boots are sooooooo super cute. #1 and #3 really work for me. I need a new pair of black combat boots! I love all these looks, especially 3 and 4. They are a great way to wear skirts and dresses in a more casual, practical way. I love combat boots and was thinking about the ones I had in the 80s and 90s this morning. Of course, I had a collection of Doc Martens (black, green and brown suede) but I also had some more refined ones. I am debating which ones to get now. My favourite outfit is the first. It is simple and interesting. That is what I am working towards. I really like this outfit formula and it would work well for my casual life style. I have a pair of Docs and motto boots that I can wear with my black coat to copy #1. We have a TV presenter in the UK called Holly Willoughby, she is all over mainstream tv. One of our popular tv shows is called ”I’m a celebrity get me out of here” and she helped present it last year. Many years ago Holly was a model, so she looks gorgeous no matter what she wear, but on the last series of Celeb, she wore combat/hiking boots with nearly every outfit. I love all these. I really need to wear my floral combat boots. I’ll do them with a solid pleated skirt & black or floral top! I’m a solid member of team dainty shoes, and don’t have patience for laces, but will enjoy seeing other fabbers rock these! How funny. For the first time in a long time I wore my combat boots today with skinny pants. I didn’t have a chance to look at YLF until late afternoon..and what do you know.. ideas for combat boots. I want to try to find more outfits for my boots this winter. If I had a long pencil skirt like #4 that might work for me. I’ve not been fond of the high top boot and bare leg look. Glad to have some other ideas to try. Jenn, I love you in this look. Bonnie, you rock the vibe. Suntiger, I bat for Team Dainty Shoe with you. In the Zombie Apocalypse, I'm wearing my fleece lined Converse hi tops. I’m wearing black heeled platform combat boots and white combat boots this winter. Feeling all the badass. I tend to need the more minimal versions or they’ll look too ginormous. I have gray suede lace- up boots that I wear for this kind of look, especially with skirts. It’s not the real iconic DM lol but the fit works. I’m glad these looks are still wearable! Not a look for me…I prefer more feminine shoe. Skipping! I love each of these outfits! Thanks Angie for the fab ideas :). 2 and 3 tickle my fancy. I’m still shopping for my combat boots. Might be pulling the trigger on some soon. I have a tough time with things like combat boots or moto jackets that add edge- because my hair is already edgy, maybe adding more just seems to push me into costume territory. Also the round toe of combat boots- I prefer pointed. But I sure have great memories of my 90s teenage Docs. KMM, I have the lilac Frye Veronicas in my cart! If I get them, I’ll definitely share! I have always loved lace up boots. Right now #4 is the most appealing but these all look appealing to me! I like all of them and all the outfits. I do not have any combat boots and not really planning to buy any. But I hope everybody else here will enjoy them. I noticed you show no high-heel versions of the combat boot. (I know you have an aversion to high heels, so it’s understandable). High-heeled combat boots are such an oxymoron, but I do have 2 prs of them and they are very stylish. Even the concept is crazy, but what the hell, ya know? I don’t try to make mine look feminine. I wear mine when I feel like looking butch, usually with a moto jacket and skinny jeans. I love every particle of that first, Architectural Darkness, look, and if I could afford Bottega Veneta boots, jeans, tote, and cashmere coat, they would all be mine. As it is, I have a pair of black Bottega Veneta sunglasses–but I’m going to challenge myself to recreate this outfit anyway. 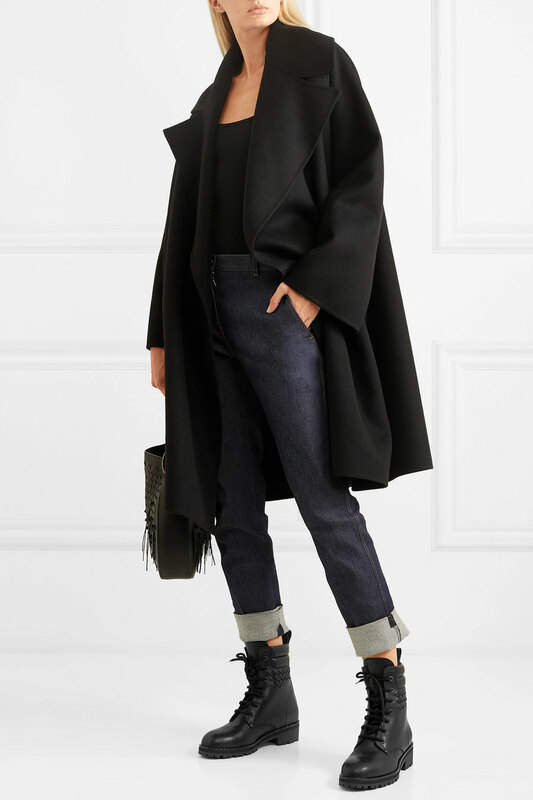 I have a vintage black cashmere swing coat with plenty of swagger and lots of boots to try (not classic black combat boots though; may need to look for some) but for me the pale turn-up on those jeans is the detail that keeps the look from being just another woman dressed all in black. Must find some dark/pale jeans! Hmm I think I had my fill of combat boots (and camouflage) while serving Uncle Sam for over a decade. I do, however, like #1 & #4. And ladies, if you want a tip on how to make combat boots comfortable, wear them in the shower & then keep wearing them until they are dry. They’ll fit you beautifully. Very late to the party after a weekend away. I love number 3 — so fun and easy going! I think I already have most of the items for #4 in my closet. I especially like “soft and playfully patterned” and “skirted equestrian.” The other day I noticed a heel has a big gouge in it on my dark-brown rough suede Born combat boots. I was thinking I need to replace them, even though I do have so many other booties. They just seem to fill a niche. I have the print Doc Martens, but they seem not quite the look you are describing here, Angie. Too clunky? I enjoyed your affection for this vibe. Firecracker, solid combat boots create the look a little more easily here, but patterned Docs are maximally fun. I love combat boots and own two pairs. My question is- if you are a professional mom with teen kids, can you wear these? Or does it look like I am trying to go back to my teen years? Feel a little funny wearing these around the school moms- maybe I need a friend group who gets it :)? These are most definitely me. I’ve been wearing variations of them since the 80’s and never gave them up! I consider them classics and was surprised they became a “thing” this winter. I recently purchased a pair of the Vivienne Westwood Seditionaries boots, which are something of a cross between combat boot and pirate boot. It’s the most expensive clothing item I’ve ever purchased (yikes were they ever), but every day I wear them I feel very happy and I’m sure I’ll wear them forever. Mita, yes Mom’s can wear them! I think the tick is to keep them toned-down a bit, like black or brown boots with leggings or wear your jeans or pants over them (like #1 but roll down hems more), or with a classic skirt. Nothing about these looks “teen” to me.